PZ Myers is an associate professor of biology at the University of Minnesota Morris (UMM). PZ Myers is also an outspoken atheist and evolutionist. The Merriam-Webster dictionary defines biology as "a branch of knowledge that deals with organisms and vital processes." Two of the most basic vital processes relating to biology are breathing and eating. It is readily conceded that PZ Myers has figured out how to breathe, but how intelligent and wise is he on the eating/drinking front? 4 Did PZ Myers give an applied biology seminar in Toronto? 7.1 Enter the applied biology fitness dragon! 9 Western atheists sumo wrestling - survival of the fattest? 10 Question: How many nanoseconds do you think PZ Myers could last in this experiment? 12 Does PZ Myers have machismo? An upcoming essay? According to Newcastle University, "The aim of applied biology is to use basic knowledge of biology for practical purposes. This requires a sound understanding of how organisms function." 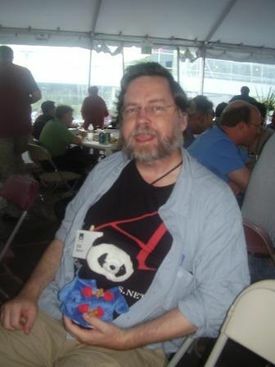 2009 pictures of a significantly overweight PZ Myers can be found HERE and HERE and HERE. A 2010 picture taken in Australia shows PZ Myers drinking ale/beer and he had excess weight in his abdominal area. In 2010, PZ Myers had health problems related to his heart. In addition, medical science research indicates that excess weight impairs brain function. Given PZ Myers' biological training and the wide dissemination of the health effects of being overweight in terms of cardiovascular health and brain function, it is unfortunate that preventative medicine was not used in greater measure in terms of his health. PZ Myers' inattention to diligently implementing the recommendations of nutritional science, exercise science, and medical science is not entirely surprising given his vehement advocacy of evolutionary pseudoscience. There have been a number of notable evolutionists who have been overweight. In 2011, Christian apologist Vox Day had an individual complain about the notion that the atheist community has a problem with obesity (please see Atheism and obesity). As a result, on May 19, 2011, Vox Day released a blog post entitled Mailvox: now, who said atheists are fat? where 80% of the people taking a picture with PZ Myers were overweight and PZ Myers was overweight in the picture as well as can be seen HERE. The picture was originally posted on PZ Myer's blog Pharyngula by Myers on May 16, 2011 and an online argument quickly ensued concerning the appearance of the photograph's participants. I saw your recent "11th day of beer" post at your blog and I am looking forward to your upcoming Slimfast and low calorie beer posts. Of course, I could add that I have my doubts that a recent post of yours at your "science" blog entitled The 5th day of beer features a low calorie beer/ale. Now could PZ Myers evolve a backbone and become more serious about losing weight? That is certainly possible. Did PZ Myers give an applied biology seminar in Toronto? A 2008 picture of PZ Myers meeting with people associated with the Center for Inquiry in Toronto can be found HERE Did PZ Myers give an applied biology seminar in Toronto to skeptics? PZ Myers, supper is on the table! Sooie! How does PZ Myers know its dinner time? Answer: His wife yells out Sooie! One of the most vociferous opponents of the atheist and evolutionist PZ Myers is the internet Christian apologist Ken Ammi who has written a collection of essays concerning the follies of PZ Myers at his website True Freethinker. In January of 2011, Ken Ammi became a National Fitness Examiner for the internet news organization the Examiner. Enter the applied biology fitness dragon! So while the biologist and evolutionist PZ Myers is giving public reports of swilling non-diet beer/ale instead of giving many reports of swilling Slimfast and low calorie beer, Christian apologist and PZ Myers critic Ken Ammi becomes the very essence of applied biology. As a result of this state of affairs, most regrettably PZ Myers has to be given a grade of F in applied biology. Of course, considering the fact that macroevolution is a pseudoscience that is counter evidence and without support, this certainly didn't help PZ Myers in terms of his applied biology grade. Some of the medical conditions associated with obesity include: type 2 diabetes, high blood pressure, high cholesterol and triglycerides, coronary artery disease (CAD), stroke, arthritis, cancer, sleep apnea, reproductive problems in women and varicose veins. In addition, medical science research indicates that excess weight impairs brain function. Medical science research indicates that excess weight impairs brain function. Concerning the issue of depression, atheists do have higher rates of suicide than the general population. Western atheists sumo wrestling - survival of the fattest? See also: Western atheists sumo wrestling - survival of the fattest? Which atheist would win a Western atheists sumo wresting competition? PZ Myers or Matt Dillahunty? Judge for yourself! Below are pictures of atheist PZ Myers and Matt Dillahunty. PZ Myers finally admits: "...I was naive and stupid". A picture of PZ Myers taken with the evolutionist Stephen Jay Gould. Perhaps if the atheist PZ Myers drank more Slimfast and less beer, he would have had a trimmer figure in this picture. PZ Myers appears to have a problem with intellectual slothfulness and perhaps his slothfulness applies to his "exercise habits" as well. As of December 26, 2010, Conservapedia is not aware of PZ Myers endorsing any exercise equipment. Question: How many nanoseconds do you think PZ Myers could last in this experiment? Question: How many nanoseconds do you think PZ Myers would last in this experiment before succumbing to temptation? Does PZ Myers have machismo? An upcoming essay? See also: Does Richard Dawkins have machismo? One of the definitions of machismo is an "exhilarating sense of power or strength". Does PZ Myers have machismo? An upcoming essay? The svelte Bible believing young earth creationist Chuck Norris endorses the Total Gym exercise system and not liposuction. If atheist Richard Dawkins finally agreed to debate Dr. William Lane Craig and a scientist at Creation Ministries International instead of making pitiful excuses, would Hispanic ladies finally believe Señor Dawkins has machismo? Olé! Olé! Olé! Please see: Does Richard Dawkins have machismo? This page was last modified on 28 January 2019, at 12:50. This page has been accessed 24,620 times.